This lecture is our fist introduction to what is called "control flow" in programming. We will start out with For Loops to demonstrate how you can do many repetative tasks without explicitly writing each successive iteration. Help on for loops can be found here. 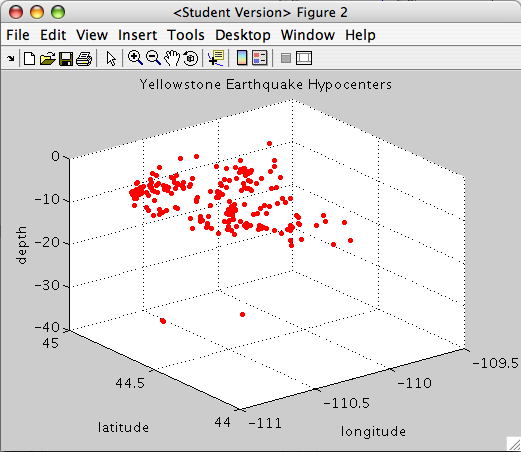 Let's go back to our Yellowstone seismicity data. In this example, I have searched for the depth values within each step (+/- half the step size from the lat long location of the estimate). Then, I computed their mean, converted the mean and some text to a string (sprintf), and plotted that amount using text. 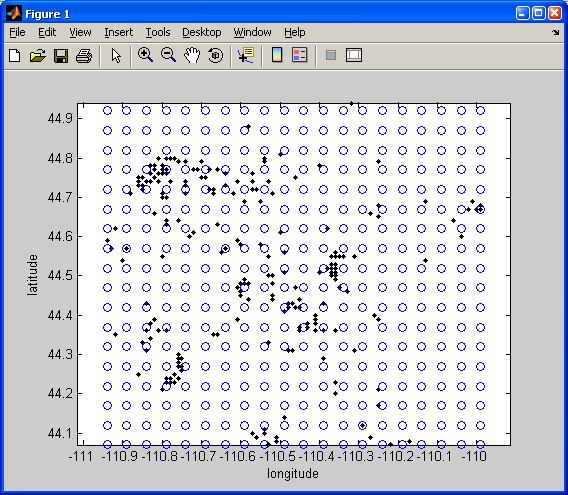 The grid on command is used to display the x,y,z grid in the background to give some perspective to the plot. We can also gather these values into a matrix that mimics our grid. 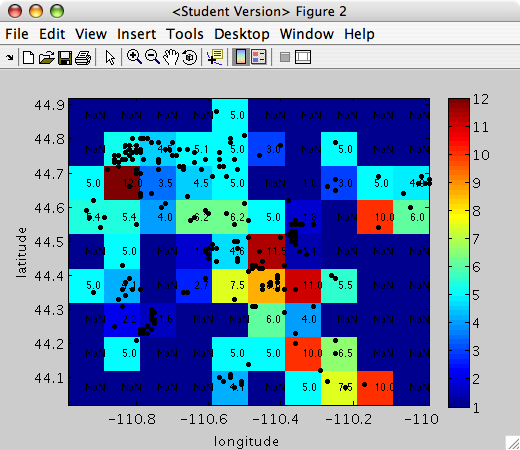 Then we can plot the scaled values in that matrix using imagesc. Repeat the last loop, but lets reference the numbers that we loop through in a little bit different way. We will also build out a matrix of our mean depth values. Notice some slight changes to our loop. Lets plot the values of this matrix using imagesc. NOTE: The colorbar function will plot the color scale for the image. The set function is used to change Properties after you have plotted your data. Here we change the property, Ydir to plot the y-axis so that larger values are above smaller values. The first argument in set is gca, which tells the set command:"I want to set a property in the current axis (the axis you just plotted your data in)." 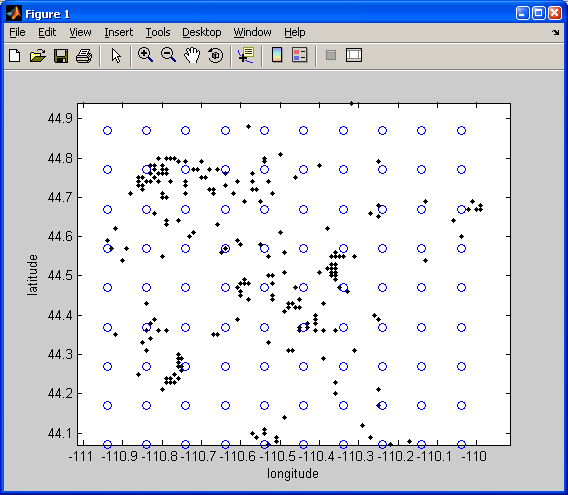 If you notice the above figure plots grids where there is "no data" (NaN) as blue. This is a limitation of imagesc. The function pcolor plots a pseudocolor image of your matrix. This is very similar to a scaled image produced by imagesc. If you use this function, your "no data" blocks will now be white. 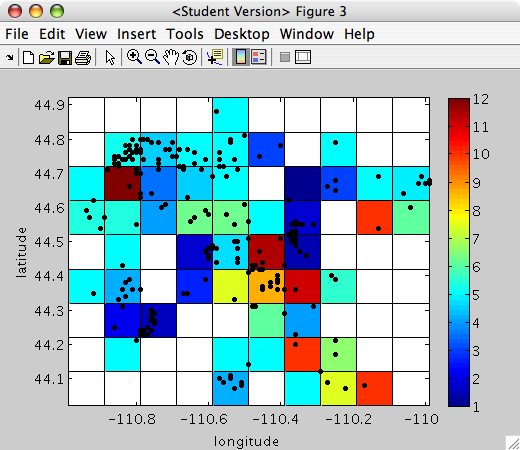 FIRST, we need to precondition our x-axis vector (long_range), y-axis vector (lat_range), and matrix (mean_depth). This is because pcolor plots the colors at the vertices (not the center of the grid like imagesc).